Members of Automobile Mechanics' Local 701 on strike. 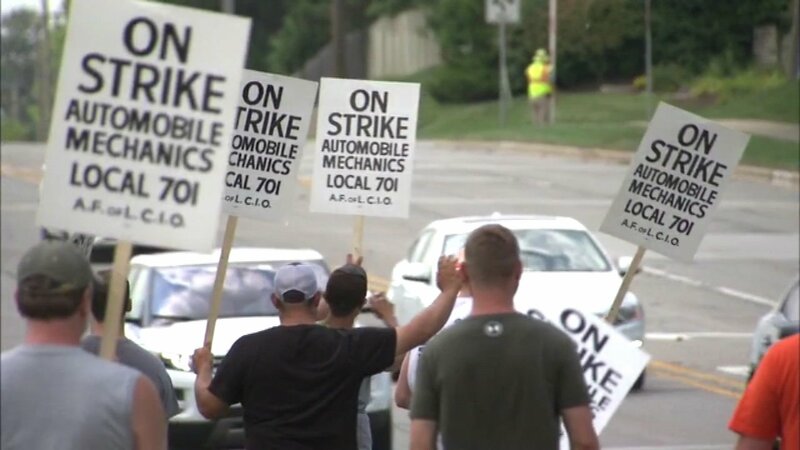 CHICAGO (WLS) -- Mechanics at 130 new car dealerships in the Chicago area will head back to work on Monday after reaching an agreement to end a seven-week strike, the union said Sunday. IAM Automobile Mechanics Local 701 ratified the four-year deal with the Chicago New Car Dealer Committee Sunday. The union said it was the fourth offer made since nearly 2,000 mechanics went on strike in early August. "We improved on each major proposal you originally asked for with the exception of one," said Local 701 Directing Business Representative Sam Cicinelli. "Did we get it all? No. But we made improvements and moved in the right direction, all while giving up nothing in exchange for those items. We earned them by laying down our tools and taking a stance." The union said the contract addresses their key issues including increased wages, advancing the career paths of semi-skilled workers, shortening apprenticeship scale from 10 to 5 years and a more family-friendly schedule for senior level technicians.